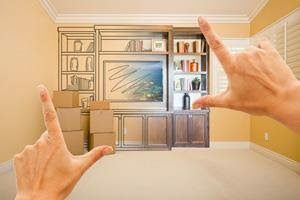 Whether you’re moving somewhere new or just bringing something new into your current house, getting furniture to fit through doorways and into your desired space can be a bit tricky. Here are some tips to fit furniture into any room in your home. Instead of dragging a piece of furniture all over, sketch out how you’ll arrange your furniture. This is especially helpful if you have narrow hallways, small rooms, or a lot of furniture. You can use paper and pencil or find a free program online to help you make a floor plan. Start by creating the outline of the room (or your whole house), trying to get the dimensions right. Next, measure the height, width, and depth of each item of furniture. Starting with the largest items first, sketch them into the desired room, then work the smaller pieces in. Remember to leave at least 3 feet for drawers, cabinets, and walkways. If you need to, you can always erase furniture and try again. If you plan ahead and take the proper precautions, you can make sure you, your home, and your furniture survive the move unscathed. Empty any drawers before you try to carry potentially heavy items like shelves, nightstands, dressers, or armoires. You can also disassemble your bed frames, couches, and dining tables to make them easier to get through doorways and narrow halls. If you’re moving to a smaller place or you just have a lot of oversized or non-essential furniture, consider paring down your collection. You can also try switching to pieces that serve multiple functions, like a sleeper sofa, storage ottoman, or tables with built-in shelves. If you’ve outgrown your current space, just let me know! I’ll be glad to help you find a home that will accommodate all of your belongings. And the same goes for anyone else you know who needs a new place to call home; I’m here to help! I can help you find the perfect place for you and your family.